Christina Lee: Like...OMG...Shut the Front Door! Because I text and tweet a lot, I find myself using acronyms even in my emails! Thankfully it has not seeped into every day speech...yet! I feel like such a "tween". Mostly I use: OMG (Oh My God), LOL (Laugh Out Loud, although I like my version better: Lots Of Laughs) and BTW (By The Way). Oh and BTW, HAGD (Have A Good Day)! I try to type hahahahahahaha, instead of lol because it just sounds deeper somehow. If I'm texting, a simple HA, will take the place of hahahahahahaha. Make sense? Love the standard, OMG; it's one of my personal favorites. If it weren't for LOL, WTF, and OMG, I wouldn't have anything to say. I think I'm a 'hahahaha' typer instead of an LOL one (which, hahahaha, I remember just now that I did that twice in my current post! ), too. Also, I now know FTW means 'for the win,' but honestly, every time I see it somewhere, I have to stop and think about what the person is trying to say. 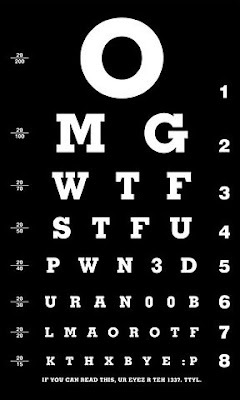 I love that eye chart. I use all of those, LOL. My mom and I chat on yahoo everyday and I find myself typing the way I text... 2: to B: be 4: for etc. And the standard LOL, OMG, BTW one I hate and actually use is bcuz. I really hate it. I mostly use it when I am super tired or lazy. LOL... actually I even say that to myself sometimes, but never out loud (YET), thank goodness :). I use OMG and BTW quite a bit too! Don't forget G2G or GTG (Got to go) and idk (I don't know). I use btw all the time...I don't even think of it as text lingo! I use W instead of with and BTW all the time. LOL is so campy that I just can't get on board, but I do XOXO. oooh, HAGD. I like it. That's a new one for me. Gotta use that one! HAGD!